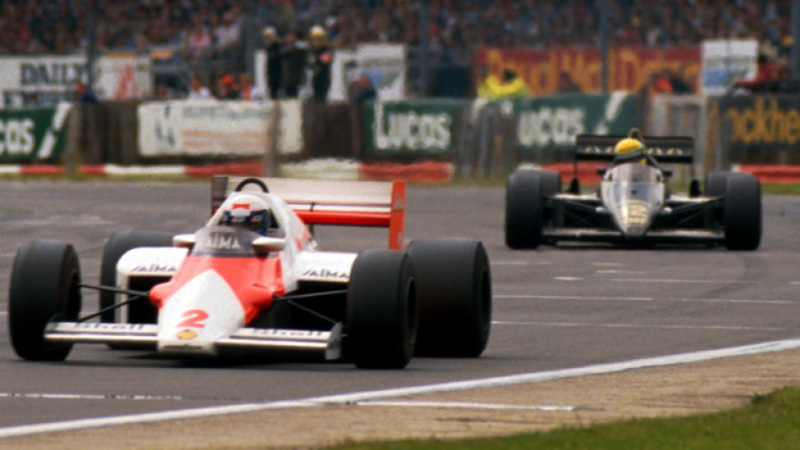 Alain Prost won the British Grand Prix after a customary measured drive but the battle for the points behind him was mired in controversy as officials waved the chequered flag a lap too early. His win was enough to take Prost to within two points of Michele Alboreto in the drivers' championship. The Saturday was dominated by Keke Rosberg who stormed to his second successive pole position with a lap so fast it was not bettered until 2002. Ayrton Senna from the second row made the best start to lead the pack through Copse Corner with Rosberg settling in behind him. Behind them was mayhem as Patrick Tambay half spun his Renault, was T-boned by the Ferrari of Stefan Johansson and in turn took out Philippe Alliot (RAM) and Piercarlo Ghinzani (Osella) who were trying to avoid the mess. Johansson continued but dropped oil around the circuit which most drivers coped with although Prost, in traffic, had a lurid slide when he first encountered the slippery stuff. Senna and Rosberg pulled away from their pursuers but Rosberg backed off to preserve his tyres and that allowed Prost to catch him. By lap 16, Prost was up to second and the McLaren was looking very strong but every time he closed on Senna, the Lotus driver upped his pace and pulled away again. The game of cat and mouse ended on the 58th lap when for the second weekend running Senna's Lotus developed engine problems. That allowed Prost through but unlike at Paul Ricard the Lotus corrected itself and within a lap Senna was back in front. The reprieve was short-lived as three laps later Senna's engine again spluttered; this time it was terminal and he retired. That left Prost a lap clear.